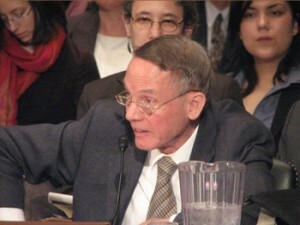 Wintery Knight Blog has an exclusive 11 page transcript of the official testimony of William Happer, the Cyrus Fogg Bracket Professor of Physics at Princeton University. This testimony was given on February 25, 2009 to the U.S. Senate Environment and Public Works Committee, chaired by Democrat Barbara Boxer. This is for you types who are certain that spending money and harming the economy is warranted because of the ‘inconvenient truth’ of man-made global warming via CO2. Your panic is unwarranted, anti-intellectual, and hurts society. Without greenhouse warming, the earth would be much too cold to sustain its current abundance of life. However, at least 90% of greenhouse warming is due to water vapor and clouds. Carbon dioxide is a bit player. There is little argument in the scientific community that a direct effect of doubling the CO2 concentration will be a small increase of the earth’s temperature – on the order of one degree. Additional increments of CO2 will cause relatively less direct warming because we already have so much CO2 in the atmosphere that it has blocked most of the infrared radiation that it can. Since most of the greenhouse effect for the earth is due to water vapor and clouds, added CO2 must substantially increase water’s contribution to lead to the frightening scenarios that are bandied about. The buzz word here is that there is “positive feedback.” With each passing year, experimental observations further undermine the claim of a large positive feedback from water. In fact, observations suggest that the feedback is close to zero and may even be negative. That is, water vapor and clouds may actually diminish the already small global warming expected from CO2, not amplify it. There is much more over at Princeton physics professor testifies to Senate about global warming. Enjoy. there may come a day when GWAs will be ashamed of their panic – then again, probably not, they'll justify it by saying "well, at least we reduced pollution in general," forgetting about the millions that their children have to pay due to the depressed economy, not to mention the millions that could have been spent on more fruitful endeavors.